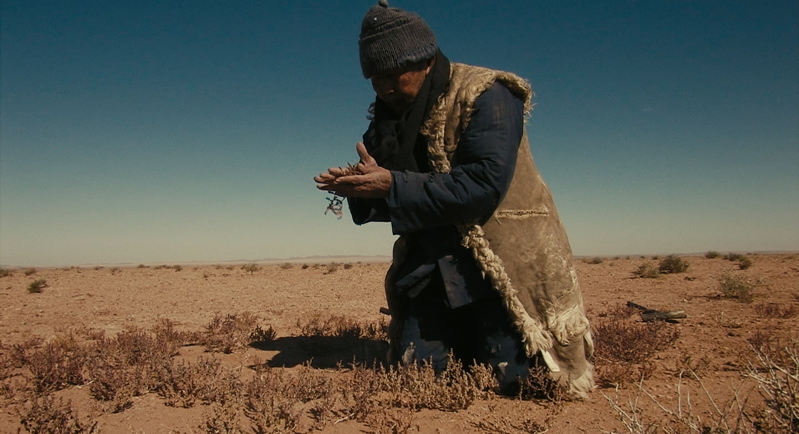 Wang Bing’s films have been high on my watch list for quite some time. West of the Tracks, a nine-hour documentary, is still waiting for me. But DVDs can be exceptionally patient, more so than humans! I finally got round seeing The Ditch (2010) after a recommendation by Michael Guarneri, who thought that the film’s content chimed well with my work on Lav Diaz. And it sure does, and yet it’s so very different. If you’re looking for a nicely photographed film, then The Ditch is not for you. It’s a simple film. The style is pretty rudimentary at times. I’m not saying that Wang Bing has chosen to make the film look amateurish on purpose. Nor am I saying that he cannot do any better. For some reason, regardless of the director’s reason and background, the style fits well to the content. Set in 1960, The Ditch tells the story of inmates of Jiabiangou, a “prisoner correction camp”, or simply a labour camp, in the Gobi Desert. The film was shot without official permission on the actual location. So that gives you an idea of how far Wang Bing is willing to go in order to tell repressed histories of his country. It also explains the rudimentary aesthetics. Wang Bing is best known for his documentaries, and if you didn’t know that The Ditch is supposed to be a feature film, you could be fooled. I found the aesthetics very documentary like. I had the feeling that Wang Bing was present at something that was, in reality, unfolding in front of him. It may have been the handheld camera. It also felt as though the characters didn’t mind the camera. They just “lived” their roles, so I felt torn between what The Ditch really was; documentary or fiction. I knew that it couldn’t be a straightforward documentary, and yet the aesthetics reminded me of it. The film is a strong image of suffering and slow death, exactly what you find in Diaz’s films. But it’s portrayed more head-on, down-to-earth without any intention to create something special. This would have turned the suffering into spectacle. By remaining at a distance, Wang Bing counters this risk. I do feel as though The Ditch should have been longer and I’m not saying this because I like long films. In order to get to the bottom of such a subject and the psychology of the characters you need to spend more than 90 minutes with them. I’m aware of the restrictions the secret production brought with it. Nevertheless, an hour more would have been sufficient to add more power to the film. The prisoners suffer from cold and hunger. One inmate is seen eating the vomit of another. Another is killing and cooking a rat, for which he is later punished. We also learn in conversations between characters that inmates cut flesh off dead inmates out of sheer desperation over their hunger. The characters’ psychology isn’t as visible as it is in Diaz’s films, which use their duration in order to demonstrate the power of the concentrationary system, i.e. terror, degradation, reducing the inmates to bare life, aiming for psychological disintegration. And because all of this needs time (the main component of the concentrationary), the film is too short for its in-depth portrayal of the subject. It’s good but too short. Some shots are beautiful and give you a sense of the vastness of the Gobi Desert. There’s no escape possible for the inmates. There’s nothing but emptiness surrounding them. There’s no hope. Even if you tried to escape, it’ll likely mean death. Nevertheless, I would like to see The Ditch as part of a bigger project, a project that positions time/duration more in the centre because it is essential for this subject. I believe that The Ditch needs a second viewing. I became extremely irritated by the arrival of a female character, who shattered my sensation of seeing something unfolding in real time. She’s the wife of an inmate who had died 8 days earlier and I don’t understand Wang Bing’s decision to include her. His film was extremely focused, to the point, and powerful. The woman was terribly artificial in her acting. She was over the top and got on my nerves. I found her unrealistic. Coming from the city, carrying a handbag – that’s fine. But carrying the handbag around in the desert while looking in despair for her husband? Taking shovel and handbag? And while the men are all wrapped up and freeze, she can stay a night without blankets and is perfectly fine. It all felt like stupid mistakes as seen in Hollywood films; completely over the top, nonsensical things. With her arrival, I became impatient with the film, which until then had been great. The female character was not necessary and took away screen time for the actual portrayal of suffering. This may be the reason why I thought that the film was too short. Anyway, I’m looking forward to more Wang Bing films. I was my first, and certainly not my last! As a result of the paper I gave at the University of Stirling at the beginning of the month, I looked more into aspects of terror. In my paper I used the term “time terror” to describe the feeling Lav Diaz generates in Florentina Hubaldo CTE (2012), Melancholia (2008) and Death in the Land of Encantos (2007). One question that came up in the Q&A after my presentation was for whom Diaz created this “time terror”. I originally only thought of the characters, who are always found in situations of anxiety, paranoia, fear, hopelessness, and uncertainty. But then there is this odd feeling I get when I watch those films, and I concluded that the “time terror” applies to both film character and film spectator. It was in a different context, namely the use of endless duration in scenes of characters walking along roads, that Diaz one said he aimed at making the viewer feel time. I don’t think this is the only circumstance where this feeling of time comes into play. I see his films as trying to convey the sensation of what life is like for the characters. In any case, I’m only playing around with thoughts, so I have by no way an answer to another really interesting (and helpful) question: what do I see as the difference between suspense and time terror? This is a very good point, and there is somewhat an agreement that Lav Diaz does not create suspense as such. It is something else, but what exactly is it? I found a book I thought could be interesting, called The Aesthetics of Terror. It had very little to do with what I actually wanted. However, there was one argument in the book that made me think: terror comes quick, often without expectations. It appears as quick as it disappears. From that point of view, my idea of terror in Diaz’s films does not seem to fit. Not if we take the modern post-9/11 sense of terror. My thought about terror stems from my reading on sociological and psychological aspects in concentration camps, where the prisoners’ time-consciousness was deliberately shattered so as to remove frameworks they could hold on to. The shattered time-consciousness led to disorientation. As I detailed in my paper, time in the camps was either experientially stretched by endless roll calls, or accelerated by sudden beatings. There was thus a persistent switch between slowness and speed. This was called terror, or totalitarianism, but because all writers came back to the same aspects of time, I termed it time terror, which suited my research, and makes this specific form of terror much clearer. Now, you do find the same aspects in Diaz’s films. There is an endless duration in his films, obviously mainly evoked by extreme long-takes, but also by long periods of silence or little action. All of this together slows down the narrative and stretches time, often to an extreme. And then you have brief intermissions, for instance in Florentina, where those stretches of endless duration are interrupted by sudden violence. This is obviously not only felt by the character. It is also the viewer who is put into states of shock after periods of peace, followed by periods of sudden violence. This all makes sense, and it only needs a few clarifications, which I’m working on in my head at the moment. But how about suspense? Hitchcock’s approach was mentioned…put the bomb under the table and have the family have dinner at it. You don’t need to see the bomb going off or anything. It’s just there. This is indeed similar to Diaz, who often prefers not to show violence, but who much rather creates sensations. So why am I speaking of ‘time terror’ and not of suspense? I’m not entirely sure at the moment, and I’d be grateful for any thoughts on this. My own thoughts were going back to the play on time. I do see a link between terror/suspense and time. I do not necessarily agree with the above mentioned argument that terror comes quick. The actual act of violence comes quick, but terror is a much larger concept. If we face it, the (Western) world has lived in fear since 9/11. This is terror. The violent attacks that we have seen since then are only a part of it, but they are not terror in itself. For me, time terror means endless duration first of all, often quite literally because we have no idea when something ends. I also think that terror is a long process, and it therefore goes well with Diaz’s extremely long films, in which he uses the time he has at his hands to create a sensation of terror. Suspense for me is more short-lived. We know suspense from pretty much all contemporary films; horror, thrillers, even comedies do contain suspense at times. But these scenes of suspense are short-lived. You do not live through hours of uncertainty before something may or may not happen. It is rare that you feel suspense for an entire two hour long film. Horror films may be a different thing to look at here. I’m not sure whether duration alone is enough to explain terror (as opposed to suspense). I think I could make a case for it, but I’m happy to hear any feedback on this issue that could help me explain my time terror theory in clearer terms. This is only one example of the regular torments in the camps. If not selected for the gas chamber, the prisoners waited for death through starvation, disease, hard manual labour and/or torture. The very focus on suffering and the delay of death shows strong similarities between life in a concentration camp and the life of characters portrayed in the films of Lav Diaz. In this paper, I will attempt to illuminate this ‘concentrationary universe’, in which Diaz creates conditions of fear, angst, torment and paranoia for the character as well as for the viewer. In doing so, I will draw from sociological writings on life in the concentration camps and a new field of research in the Humanities, which has its origins at the University of Leeds under the direction of Griselda Pollock and Max Silverman. I will also include parts of the interview I conducted recently with Diaz at the Locarno Film Festival, where I asked him specifically about the treatment of suffering in his films. To begin with, the term ‘concentrationary’ is taken from the French ‘concentrationnaire’, which in itself stems from the title of the 1946 book ‘L’univers concentrationnaire’ by David Rousset, a former political prisoner of Buchenwald concentration camp. It has also been used extensively by Primo Levi in his last book ‘The Drowned and the Saved’, or rather by the translator Raymond Rosenthal, as far back as the 1980s. The death factory was an apparatus that functioned smoothly, virtually trouble-free, working at high capacity and speed. A death train arrived at the ramp in the morning; by the afternoon, the bodies had been burned, and the clothing brought to the storerooms (259). In the concentration camps, on the other hand, prisoners often died slowly, as a result of a continuous infliction of hardships. Paul Neurath (2005), survivor of Buchenwald and Dachau concentration camps, contends, “The camp usually kills its victims in less spectacular ways. It is comparable not so much to a ferocious murderer who runs amok, as to a dreadful machine that slowly, but without mercy, grinds its victims to bits” (47-48). As I am hoping to demonstrate in this paper, a major characteristic of Diaz’s films is the focus on suffering. His films represent characters who are or have been target of oppressive governmental forces, and turn into living corpses as a result of it. What stands out in his films Melancholia (2008), Death in the Land of Encantos (2007), and Florentina Hubaldo CTE (2012) is that the characters are caught in a web of persistent fear and terror. Death, while at times desired on the side of the persecuted, is prevented, or rather not granted. Rather, according to Pollock and Silverman, the aim of the concentration camp, and in extension of the concentrationary universe, is “to submit inmates to a prolonged process of psychological disintegration, reduction to bare life and, hence, to becoming a living corpse” (Pollock, Silverman 2014, 11). This focus on psychological processes in the characters is supported by the aesthetics Diaz employed for these films, first and foremost by the particular length of his films. The in-depth depiction of fear, angst, and paranoia over the course of, at times, nine hours is an aesthetic of Diaz’s concentrationary universe. It is further supported by the use of extreme long-takes. As Sam Littman (2014) contends with regard to contemporary Romanian cinema, “the long take len[ds] itself perfectly to expressing psychological realism.” There is thus a link between slowness and the concentrationary, which I want to explore in more detail now. Analysing the concentration camp system as a site of terror, Wolfgang Sofsky (1997) points to the presence of an “endless duration that was constantly interrupted by sudden attacks and incursions. In this world of terror, a single day was longer than a week” (24). This very cycle of endless duration and sudden attacks is most prominent in Diaz’s six-hour film Florentina Hubaldo, which portrays a young woman being subjected to repeated rapes. The film follows her mental degradation as a result of CTE, a degenerative disease of the brain, whose onset stems from brutal treatment at the hands of her father. Just as concentration camp or even Soviet Gulag prisoners were deemed to be more useful as long as they could work, so Florentina, too, is denied death foe economical reasons. Her body is a mere product her father sells in order to earn a living. Her treatment thus attempts to strike a balance between a sufficient degree of subordination without gravely compromising her ability to “work”. Diaz disrupts this endless suffering of Florentina with attacks on the viewer’s senses, mainly by shock moments delivered through high-volume noise or absolute silence. Juxtaposing almost endless scenes of Florentina’s suffering with sudden attacks delivered through sound, Diaz’s six-hour film is a close representation of the concentrationary universe in which Florentina eventually, after six hours, dies as a result of a continuous infliction of miseries. At some point, death will come. It’s like a premeditated thing. … hell is coming, and it’s always like that. It’s like a concentration camp. You’re compartmentalised; this is the new group, we need to orient them on how to work on these things, then, next compartment, we will not feed them, and the next compartment is the gas chamber where we kill them. So it’s a part of compartmentalisation. There is slow death. Sofsky argues that this slow pursuit of gradual destruction of the human being “allowed death time” (1997, 25). This argument can be extended to the treatment of characters in Diaz’s films. Neither Florentina in Florentina Hubaldo, nor Hamin in Encantos, or even Renato in Melancholia see a sudden death. 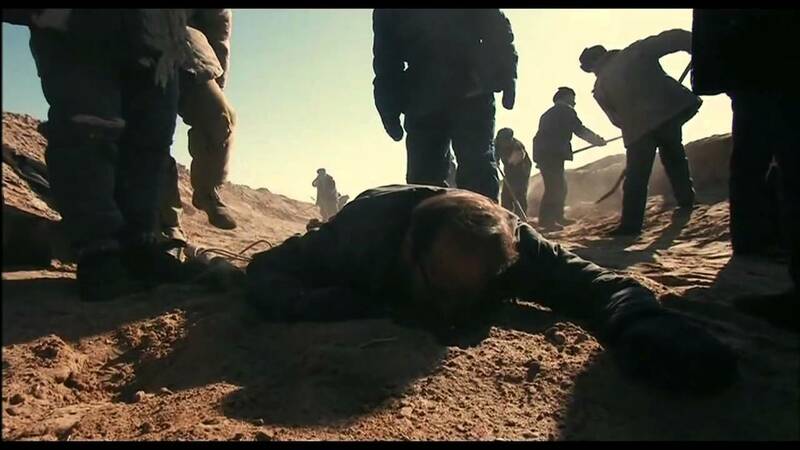 Their death, which is not always visualised on screen, comes rather as a result of repeated inflictions of attacks, both violent and non-violent. Death always comes slowly, which aggravates the characters’ suffering to an unbearable degree. What I would like to highlight in this context is Sofsky’s use of “death time”. Even though it looks unlikely that Sofsky meant to create an entirely new term here, I would like to read it as such as it makes for an intriguing factor in the analysis of slow films. Slow Cinema has been repeatedly discussed in terms of temps mort, or dead time, as a governing factor of the aesthetics of slowness. In very simple terms, dead time in film means that nothing is happening in a scene, often quite literally at the end of a scene, when characters have exited the frame and the camera remains focused on an empty setting. I would argue that more than any other slow-film director, Diaz uses “death time” more than “dead time” in his films. In doing so, he puts emphasis on the use and effects of terror on individuals as well as on entire societies. The use of “death time” is most evident in Diaz’s eight-hour film Melancholia, a film about three characters, who have self-devised a coping mechanism to get over the loss of their loved ones; activists who disappeared. They immerse into different roles in society, “so that we could regain our feelings. So that we could survive. So that one day, we could live again” as Alberta, one of the main characters, describes it. The film ends with a ninety minutes long flashback of Renato, an activist, and two other resistance fighters trapped on an island, after the military surrounded it. In those ninety minutes, little happens on-screen. In fact, all we see is three men sitting and waiting for their death. Or else, we don’t see anything as Diaz resorts to night-time shots without artificial lighting. Renato, one of the activists, writes letters to his wife, giving an insight into the conditions of the resistance fighters. He reveals that they are aware of death coming, but Diaz refrains from granting them the relief one of the fighters is demanding, as we will see shortly. Instead, Diaz follows the military’s play on psychological warfare and creates an unnerving situation for both character and viewer, through oppressive silence, lack of action, night-time shots, and endless periods of waiting. I want to show you a brief extract of the film, which demonstrates Diaz’s approach, and which also shows the effects of the persistent terror on the fighters. What we could see in this extract is the mental degradation of one of the fighters, whose resistance has been crushed by psychological warfare. The certain death, yet uncertain point of death causes a slow degradation of the character’s mental state, in similar ways we can see in Florentina. The man loses his sanity, which is not only apparent in his erratic and incomprehensible movements and behaviour throughout the second half of this part of the film. Especially at night, his visual and aural perception is distorted by severe paranoia. Here again, as indicated in previous brief reflections on Florentina, Diaz creates a concentrationary existence for the characters. He generates a so-called “torment of duration” (Ibid., 81), which Wolfgang Sofsky emphasised in his discussion of “camp time” that was very specific to the concentration camps. Time was manipulated; it was slowed down by endless roll calls every morning and evening, or experientially accelerated by sudden attacks and beatings. Diaz’ trilogy of post-trauma contains this very combination of what I would term “time terror” for the characters as well as for the viewer; seemingly endless long takes in which little happens are juxtaposed with sudden scenes that invoke shock. In conclusion, I would like to refer to Matthew John (2014), who contends that “the horror of the concentration camp system lies not with the abrupt and immediate extermination of human life, but rather with the slow and agonizing decay of the body and mind” (83, emphasis added). This is precisely the feeling you get as a viewer if you have the stamina to sit through a Lav Diaz film. I would also like to add that the concentrationary is a site of trauma. Just like trauma, “terror [and in extension the concentrationary] destroys the flow of time” (Sofsky 1997, 78). Trauma thus locks the survivor-victim into a continuous, cyclical past. And this is where the concentrationary meets my previous research into the representation of trauma, forming a new powerful framework, based on Diaz’s own experience under Martial Law in the Philippines in the 1970s. He was beaten, locked up in a school house with 150 other families without permission to leave, with the military deciding how much food the people receive per day. People were guarded like prisoners, and shot when they left the school yards because of “communist activities”. Diaz called it “our own version of the concentration camps”. He witnessed atrocities committed against men, women, and children and has lost several friends to torture and extra-judicial killings. While Pollock and Silverman’s study into the concentrationary is very much limited to art that makes explicit references to Nazi concentration camps, I intent to broaden the area. I am not only led by the aesthetics of Diaz’s cinema, but also by David Rousset’s warning that “it would be duplicity … to pretend that it is impossible for other nations to try a similar experiment [as Nazi Germany did] because it would be contrary to their nature. … under a new guise, similar effects [of the concentrationary universe] may appear tomorrow” (1951, 112). As I have hopefully demonstrated today, my thesis will, in parts, add to this new research into the aesthetics of the concentrationary, but suggests a different approach to it by focusing on the experience and the time-consciousness in concentration camps and in the films directed by Lav Diaz. If you want to use any of the material above, please get it touch and cite it appropriately. Thank you! Edit (22 September 2014): Lav Diaz pointed out that he was not tortured under Martial Law, as described in my paper. I’m not sure why this mistake has occurred. I suppose I start to mix up literature. Thank you, Lav, for clarifying this!